For the past several years, Greenlining has led a statewide coalition to advocate for not-for-profit hospitals to increase investments that improve the holistic health and well-being of communities of color and low-income communities. 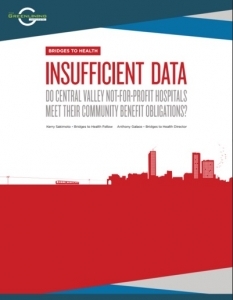 Each year, not-for-profit hospitals receive billions of dollars in tax exemptions and subsidies – totaling nearly $3.3 billion amongst not-for-profit hospital systems in California in 2010. In exchange, these hospitals are required to provide vital investments that address the health needs of the communities they serve, with an emphasis on building community health and disease prevention. These investments are known as community benefits. Communities of color and low-income communities, California’s most vulnerable populations, have the most to gain from community benefits when these investments target the root causes of poor health – poverty, lack of access to healthy foods, and poor air and water quality, to name a fe w.
How would you invest in the health of your community? Growing up, I learned the importance of listening to my family, friends, and neighbors. When I was 5 years old, I remember sitting at the end of our driveway with my grandpa, listening as he talked to everyone who walked by. Nearly half a century later, he knew something about everyone in our neighborhood. From the wisdom of those around me, I felt the pulse of my community. Sociologist David Brain said, “Community is something we practice together. It’s not just a container.” Like science, medicine, and technology, becoming an expert on the needs of your community takes dedication and years of study. There are no better experts on the needs of a community than those, like my grandpa, who “practice” community every day. Today, Governor Jerry Brown continued California’s commitment to language access in health care by signing Assembly Bill 389 into law. The new law, authored by Assemblymember Ed Chau (D-Monterey Park) and sponsored by the California Pan-Ethnic Health Network (CPEHN), directs a general acute hospital to post its language assistance policy for Limited English Proficient (LEP) individuals online and requires hospital websites to include a notice about the availability of those services in the five most common non-English languages. Existing law requires hospitals to annually report to the California Department of Public Health their policies for assisting patients with language needs. Currently these plans are only available in paper form and are not publicly reported. This makes it difficult to ensure that hospitals are meeting the needs of their LEP patients. AB 389 provides greater transparency by centralizing this information and directly connecting LEP patients to language assistance services on hospital websites. Below is a press release sent out today by Assemblymember Ed Chau's office introducing a bill that CPEHN is sponsoring. Be sure to check back here on our blog for updates on this important legislation in the coming months! Sacramento — Today, Assemblymember Ed Chau (D-Monterey Park) introduced AB 389, which would direct a general acute hospital to post its language assistance policy for limited-English proficient (LEP) individuals online and require the California Department of Public Health and the Office of Statewide Planning and Development to post this information on their websites, as well. California’s Kopp Act requires all hospitals in the state to file a copy of their language assistance policy, and annual updates, with the Department of Public Health (DPH). The intent is to ensure that every resident, regardless of language capability, can access health services in a hospital setting. However, hospitals currently submit their policies and procedures to the respective DPH Licensing and Certification District Office. Having the policies spread out makes it difficult for policymakers and the public to access them and to ensure the appropriate protections and practices set forth by the State are being adhered to. AB 389 would provide greater transparency and oversight of the Kopp Act by centralizing this information to confirm that hospitals are complying with this key accountability measure and meeting the needs of LEP patients.